Jenna-Louise Coleman (born 27 April 1986), known professionally as Jenna Coleman, is an English actress. 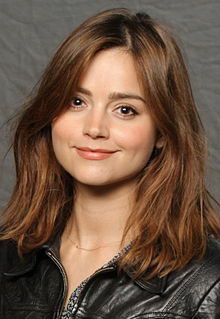 She is known for her roles as Jasmine Thomas in the ITV soap opera Emmerdale, Clara Oswald in the BBC series Doctor Who and Queen Victoria in the ITV biographical drama Victoria. Coleman was born in Blackpool, Lancashire, England, and began her acting career at an early age as a member of a theatre company called In Yer Space. While auditioning for drama schools in 2005, she was chosen to play Jasmine Thomas in Emmerdale. She received critical acclaim for her performance and was nominated for the Most Popular Newcomer award at the 2006 National Television Awards. Coleman went on to play "hard girl" Lindsay James in the BBC school-based drama series Waterloo Road (2009), Susan Brown in a BBC Four television adaptation of the John Braine novel Room at the Top (2012), Annie Desmond in Julian Fellowes' four part mini-series Titanic (2012) and Rosie in Stephen Poliakoff's original drama series Dancing on the Edge (2013). She appeared as Lydia Wickham in the BBC drama miniseries Death Comes to Pemberley (2013) and as Katrina Clark in the romance film Me Before You (2016). Coleman was born in Blackpool, Lancashire, the daughter of Karen and Keith Coleman. She has an older brother named Ben. She attended Arnold School, where she was head girl. She has stated that she regrets not having a conventional university experience. While at school, Coleman was a member of the theatre company In Yer Space, with which she performed in the play Crystal Clear at the Edinburgh Festival. She won an award for her performance, and the play was also received favourably. In an interview with The Radio Times in 2015, she revealed that her grandmother had named her Jenna after the character of Jenna Wade played by Priscilla Beaulieu Presley in the 80s American TV drama series Dallas. While auditioning for drama schools, Coleman landed the part of Jasmine Thomas in Emmerdale in 2005. At the British Soap Awards 2007, she was nominated for the "Best Newcomer" award, and at the National Television Awards 2006, she was nominated for the "Most Popular Newcomer" award. At the 2009 British Soap Awards, she was nominated for the "Best Actress", "Sexiest Female", and "Best Dramatic Performance" awards. She received a nomination for the "Best Actress" award from the TV Choice Awards. In May 2009, it was announced that Coleman would be joining BBC school-based drama series, Waterloo Road, as "hard girl" Lindsay James. As she was 23 at the time of her casting, Coleman found the experience of playing a schoolgirl "surreal". In December 2010, it was announced that Coleman would be playing Susan Brown in a BBC Four television adaptation of the John Braine novel Room at the Top. The adaptation was originally intended to air in April 2011, but this was cancelled due to a rights dispute between the production company and Braine's estate. The dispute was resolved by 2012, and the show aired in two parts on 26 and 27 September 2012. In 2011, she made her feature film debut in Captain America: The First Avenger. She also landed the part of Annie Desmond in Julian Fellowes' four part mini-series Titanic, describing her character as a "cheeky little Cockney" and "the Eliza Doolittle of the ship". Coleman provided the voice for the character Melia in the English dub of the 2011 video game Xenoblade Chronicles. In 2012, Coleman was cast as Rosie in Stephen Poliakoff's original drama series Dancing on the Edge, which follows the fortunes of a black jazz band in the 1930s. The show aired on BBC Two in February 2013. She starred as Lydia Wickham in the adaptation of Death Comes to Pemberley. The three episodes were shown on BBC One during Christmas 2013. In April 2015, it was announced that Coleman would be playing the role of Katrina Clark in the film Me Before You, which was released on 3 June 2016. She made a guest appearance in the episode "Earthbreaker" of the animated science fiction show Thunderbirds are Go. In December 2017, it was announced that Coleman would be the narrator for a Royal Caribbean UK advertising campaign. On 8 January 2018, Coleman was confirmed to play Joanna in the four-part BBC drama The Cry, an adaptation of the 2013 novel by Helen FitzGerald. In September 2018, the Old Vic Theatre announced on their website that Coleman would star in a new production of All My Sons in 2019. On 21 March 2012, Doctor Who producer Steven Moffat confirmed at a press conference that Coleman would play the companion of the Eleventh Doctor (Matt Smith). Moffat chose her for the role because she worked the best alongside Smith and could talk faster than he could. She auditioned for the role in secret, under the pretense of auditioning for Men on Waves (an anagram for "Woman Seven": she would first appear in the show's seventh series). Although originally announced as beginning her run as companion in the Christmas special in 2012, Coleman made a surprise appearance on 1 September 2012 in the first episode of the seventh series as Oswin Oswald, a guest character who dies at the conclusion of the episode. Coleman subsequently debuted as a series regular in the Christmas special episode "The Snowmen" as Victorian governess and barmaid Clara Oswin Oswald; like Oswin Oswald, she died. At the end of that episode, Coleman is seen playing a third version of the character, a resident of contemporary London named simply Clara Oswald. Beginning in "The Bells of Saint John", this version begins her travels as the Doctor's regular companion, including after his regeneration into the Twelfth Doctor, played by Peter Capaldi, in the 2013 Christmas special episode "The Time of the Doctor." In the 2014 Christmas special episode "Last Christmas", it was revealed that Coleman would remain in the role of Clara for Series 9. However, the ninth series was her last, as Coleman had decided to leave the show to take on a role as Queen Victoria in an ITV production. In "The Zygon Invasion" and "The Zygon Inversion", Coleman also played the role of Bonnie, the Zygon leader who took the form of Clara Oswald. She returned to the show for Twelfth Doctor's last episode "Twice Upon a Time" where she made a cameo appearance; that episode, Doctor Who's 2017 Christmas special, aired the same evening as the first Christmas special for Victoria. She was first credited on screen as Jenna Coleman in Doctor Who Live: The Next Doctor, which aired on 4 August 2013. In 2016 Coleman starred in ITV's eight-part drama following the reign of the British monarch and Empress of India, Queen Victoria. The actress confessed that she was not totally informed about Victorian history, but researched the role. When interviewed for BBC Radio 4's Woman's Hour, Coleman expressed her admiration for the monarch. She argues that this role meant she was able to break out of her supposed 'box' as a northern working-class character that Emmerdale put her in. Victoria premiered on 28 August 2016 on ITV, and in September 2016, ITV renewed Victoria for a second series. A Christmas special for 2017 was also commissioned and a third series was announced in December 2017. The third series debuted first on PBS Masterpiece in January 2019, followed by a belated broadcast debut on ITV in late March 2019. Prior to filming the third series of Victoria, Coleman took the lead role in The Cry, a four part Scottish-Australian co-production adapting Helen FitzGerald's crime novel about the search for a missing baby. The production was filmed in Australia and Scotland in the early months of 2018, and aired on BBC One from September to October 2018. In September 2018, the Old Vic theatre in London's West End announced that Coleman had joined the cast of a production of All My Sons, which is scheduled to run from April 13 to June 8, 2019, which will include a cinema screening via National Theatre Live on May 14, 2019. In February 2019, it was announced that Coleman would make a guest appearance in an episode of the comedy series Inside No. 9, with an expected broadcast date later in the year. Coleman has been involved with charity work in South Africa raising awareness of HIV with One To One Children's Fund, for which she is an ambassador. She is also an ambassador for Place2Be, a charity providing emotional and therapeutic services in schools. Coleman dated actor Richard Madden from 2011 to 2015. In 2015, she began dating her Victoria co-star Tom Hughes. 2016 Doctor Who: Destiny of the Doctor Alice Watson / Eleventh Doctor Episode: "The Time Machine"
^ Jeffery, Morgan (21 March 2012). "Jenna-Louise Coleman: Ten Things about the new 'Doctor Who' star". Digital Spy. Hearst Magazines UK. Retrieved 21 March 2012. ^ a b Jones, Paul. "Jenna Coleman and the mystery of the missing Louise". Radio Times. Retrieved 20 June 2013. ^ a b Jeffrey, Morgan (29 May 2012). "'Room at the Top': BBC Four drama to air following legal dispute". Digital Spy. Retrieved 29 May 2012. ^ a b Wilkes, Neil; Welsh, James (31 October 2006). "National TV Awards 2006: Full winners list". Digital Spy. Hachette Filipacchi UK. Retrieved 19 March 2012. ^ a b Green, Kris (13 May 2009). "Ex-'Emmerdale' actress joins 'Waterloo Road'". Digital Spy. UK. Retrieved 21 March 2012. ^ Lewis, Tim (10 November 2013). "Jenna Coleman: just what the Doctor ordered". The Guardian – via The Guardian. ^ Lockyer, Daphne (21 August 2016). "Jenna Coleman on playing Queen Victoria: 'We certainly don't shy away from the fire and the passion'". The Telegraph. ^ "Blackpool soap star needs your help". Blackpool Gazette. 31 July 2006. Archived from the original on 28 September 2007. Retrieved 2 September 2007. ^ Green, Kris; Kilkelly, Daniel (10 May 2009). "British Soap Awards 2009: The Winners". Digital Spy. Hachette Filipacchi UK. Retrieved 21 March 2012. ^ Kilkelly, Daniel (29 October 2009). "Coleman: 'Waterloo Road is surreal'". Digital Spy. UK. Retrieved 21 March 2012. ^ "Stars in city to remake classic film". The Bradford Telegraph & Argus. UK. 27 December 2010. Retrieved 7 October 2012. ^ "Casting Unveiled on Room at the Top". UK: Screen Yorkshire. 22 December 2010. Archived from the original on 28 September 2011. Retrieved 7 October 2012. ^ Conner, Megan (11 March 2012). "Why we're watching: Jenna-Louise Coleman, actor". The Observer. Retrieved 11 March 2012. ^ Lazarus, Susanna (18 June 2013). "Jenna-Louise Coleman, Penelope Keith and Rebecca Front join Death Comes to Pemberley". Radio Times. Retrieved 22 June 2013. ^ Lazarus, Sussana (26 December 2013). "Death Comes to Pemberley's Matthew Rhys: "The best thing about playing Mr Darcy is that shirt"". Radio Times. Retrieved 26 December 2013. ^ Kemble, Harry (19 December 2017). "Royal Caribbean ad campaign makes "groundbreaking" switch from TV". Travel Weekly. Retrieved 20 December 2017. ^ "Jenna Coleman to star in new BBC drama". BBC News. 2018. Retrieved 8 January 2018. ^ "Jenna Coleman joins All My Sons for Old Vic season". BBC News. BBC. 14 September 2018. Retrieved 14 September 2018. ^ "Jenna Coleman: 'Being me makes me feel self-conscious'". The Guardian. Retrieved 16 September 2018. ^ "Doctor Who's latest companion is unveiled". BBC News. 21 March 2012. Retrieved 21 March 2012. ^ Jeffery, Morgan (21 March 2012). "'Doctor Who': Jenna-Louise Coleman – The press conference in full". Digital Spy. Retrieved 27 March 2012. ^ Gallagher, William (27 March 2012). "Doctor Who's secret history of codenames revealed". Radio Times. Archived from the original on 28 March 2012. Retrieved 27 March 2012. ^ Brown, David (1 September 2012). "Doctor Who – a message from Steven Moffat and Jenna-Louise Coleman about tonight's surprise". Radio Times. Retrieved 7 October 2012. ^ Steven Moffat (writer), Colm McCarthy (director), Denise Paul (producer) (30 March 2013). "The Bells of Saint John". Doctor Who. Series 7. Episode 7. BBC. BBC One. ^ Steven Moffat (writer), Jamie Payne (director), Marcus Wilson (producer) (25 December 2013). "The Time of the Doctor". Doctor Who. Series 7. BBC. BBC One. ^ Dan Martin (25 December 2014). "Doctor Who recap: Last Christmas". the Guardian. ^ "Jenna Coleman is Leaving Doctor Who". BBC. 18 September 2015. Retrieved 18 September 2015. ^ Barraclough, Leo (18 September 2015). "Jenna Coleman Leaving 'Doctor Who' to Play Queen Victoria". Variety. Retrieved 18 June 2016. ^ "Doctor Who Live: The Next Doctor". BBC One. BBC. Retrieved 5 August 2013. ^ a b "Jenna Coleman as young Queen Victoria". ^ Furness, Hannah (12 August 2016). "Jenna Coleman plays Queen Victoria as she's never been seen before – a lusty teenager who gains the throne". The Telegraph. Retrieved 12 August 2016. ^ Martin, William (23 September 2016). "Jenna Coleman's 'Victoria' will return for a second season". CultBox. Retrieved 23 September 2016. ^ Clarke, Stewart (12 December 2017). "Jenna Coleman Returning for 'Victoria' Season 3". Variety. Retrieved 20 December 2017. ^ "All My Sons". oldvictheatre.com. Retrieved 11 April 2019. ^ "All My Sons - National Theatre Live". ntlive.nationaltheatre.org.uk. Retrieved 11 April 2019. ^ Bley Griffiths, Eleanor (18 February 2019). "Doctor Who and Victoria actress Jenna Coleman to guest star in Inside No 9". Radio Times. Retrieved 11 April 2019. ^ "Jenna Coleman Video". onetoonechildrensfund.org. Archived from the original on 9 January 2015. ^ "Actress Jenna Coleman becomes ambassador for Place2Be". Place2Be. Retrieved 1 November 2017. ^ "Doctor Who star Jenna Coleman in love split...but Who made it happen?". 5 June 2015. ^ Reporters, Telegraph (18 September 2016). "'Victoria' stars Jenna Coleman and Tom Hughes 'secretly dating in real life'". The Telegraph. ^ "Jenna Coleman to star as Queen Victoria in major new ITV drama Victoria". ITV Media Centre. 18 September 2015. Retrieved 18 September 2015. ^ "Check out Jenna Coleman's American accent in Thunderbirds Are Go". Retrieved 16 January 2017. ^ "News – Thunderbirds Are Go". Retrieved 16 January 2017. ^ "Jack and the Beanstalk". ^ a b c Green, Kris; Kilkelly, Daniel (10 May 2009). "British Soap Awards 2009: The Winners". Soaps News. Digital Spy. London: Hearst Magazines UK. Retrieved 12 April 2015. ^ "Winners Announced – British Academy Cymru Awards 2015". bafta.org. 27 September 2015. ^ "The Academy of Science Fiction Fantasy and Horror Films". saturnawards.org. ^ "Golden Nymphs Awards Winners". www.tvfestival.com. Retrieved 6 November 2017. ^ "Women of the Year 2018: winners portfolio". Harper's BAZAAR. 30 October 2018. Retrieved 2 November 2018. ^ "Awards 2018". I Talk Telly | by Elliot Gonzalez. Retrieved 9 December 2018. ^ "2018 Movieguide Awards Nominations". The Movieguide® Awards. Retrieved 4 March 2019. 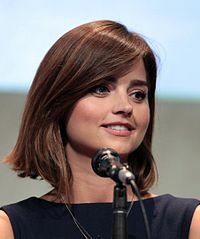 Wikimedia Commons has media related to Jenna-Louise Coleman. This page was last edited on 20 April 2019, at 07:19 (UTC).